A number of the oppressive acts against First Nations committed by the settlers and the Canadian state we learned about in Alberta were also perpetrated in British Columbia. The same pattern of the spread of diseases, the appropriation of land, the extraction of resources, the destruction of culture through missionary zeal, the prohibition of ceremonies and the removal of children to residential schools were also part of the stories we were told here. Just as the bundles were targeted by missionaries in Alberta, in B.C. 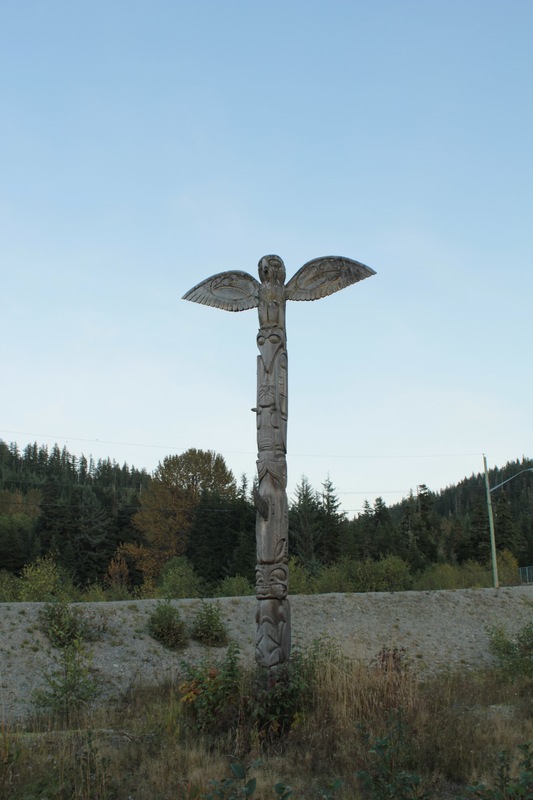 it was the totem poles which were taken to be the most visible expression of local beliefs and ceremonies. These were either burnt or bought, at times under dubious circumstances, finding their way to museum collections across the world. In time few master carvers and artists, with skills that had been passed down from generation to generation for thousands of years, remained. 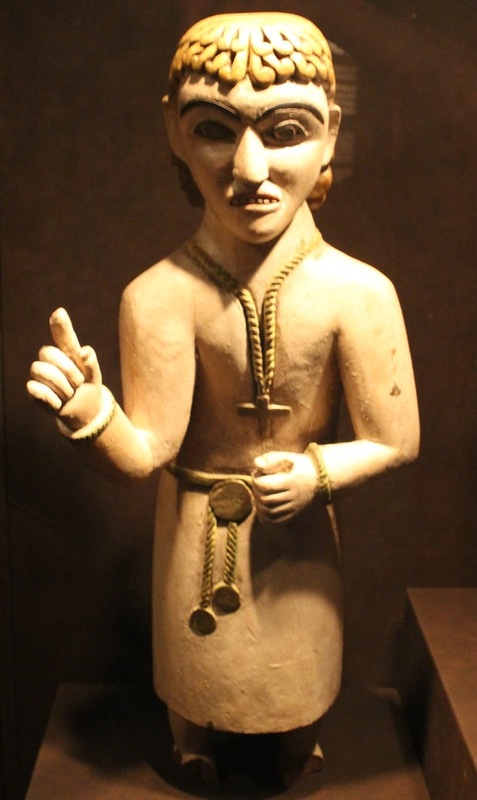 For several generations no poles or masks were carved in many of these communities. It was not until after the Second World War and the period of gradual removal of the oppressive laws against First Nations peoples that a group of artists started to re-learn the art, piecing fragments together from surviving artists and learning from the old pieces that were scattered across collections throughout the world. Pioneers such as Bill Reid, Freda Diesing her student Dempsey Bob and others, provoked a resurgence in northwest coast art. Whereas today a number of professional and world renowned artists from this region ensure the place of this art form in the public imagination and in the international art market, the Freda Diesing school is the only one in the country that provides training for a new generation of artists. As Dempsey and other instructors we talked to put it, it is hard to be an artists and develop these skills by yourself. The school provides an environment where this development is nourished and supported by a community of other artists, instructors and fellow students. We wake up early in our first morning in Terrace and drive from our motel to meet Dempsey Bob, a leading First Nations artist and co-founder of the Freda Diesling School of Northwest coast Art, at his home in a leafy street of wooden houses near the center of the town. We do not know what to expect but from his brief emails and his phone call to the motel this morning Dempsey seems friendly and welcoming. Arriving at his house we are greeted by a man with a kind, warm smile and creative eyes who accompanies us to the School. We take a short detour for breakfast and then try to catch up with the yellow school bus that is taking the students from the School to the recently opened Nisga’a museum two hours north along route 113. The drive on the 113 is of intense beauty. A Northern landscape of towering mountains thinly covered in snow and vivid yellow autumnal trees draped in morning mist. The mist opens up into a surreal landscape of volcanic rocks, sharp but spherical and covered in bright light-green moss and lichen. An eagle lands on the road ahead of us and Dempsey says it is a good sign. On the drive back two black bears rustle into the trees, also a good sign. We speak to Dempsey for the two hours there and two hours back and he tells us his story. The story is of how he became an artist, how he learnt from others especially Freda Diesing, during a long period of apprenticeship, of how he was then sent north to Alaska to teach art there and also learn more of the art of his people, teaching in many places such as prisons and schools. He also told us more about his culture and its art, of stories from his grandparents. The drive went by quickly and we arrive in Nisga’a territory in no time. 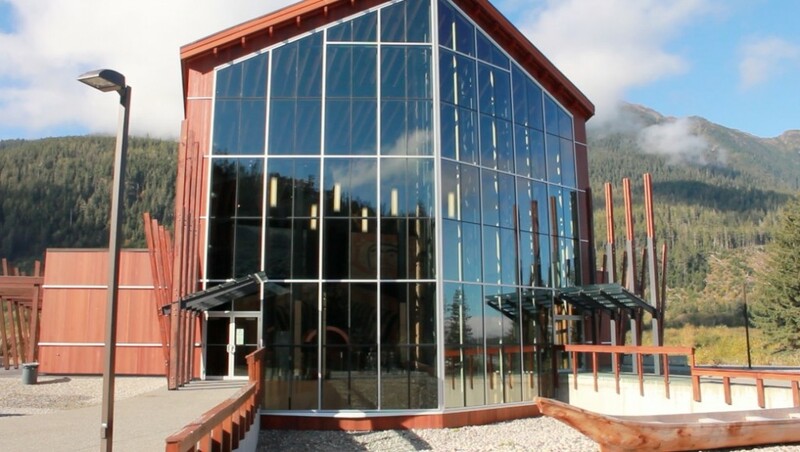 The Nisga’a museum is in the village of Laxgalts’ap, in the territory of the Nisga’a people who have just recently settled their land claim with the Canadian government. With this settlement the Nisga’a have also been awarded the rights to reclaim their cultural property which has been housed in several museums in Canada. The newly constructed museum is a beautiful building combining traditional and contemporary architecture and materials. We arrive with Dempsey just as the museum guide is giving her opening talk to the students. Inside we are guided through the exhibits – wooden masks, shaman regalia, rattles, blankets, spoons and other ceremonial pieces. The group of students respectfully listens and walks through the museum, looking and photographing the artefacts. At the end of the tour a student eloquently thanks the guide and offers her gifts on behalf of the School, congratulating her Nation on their land settlement on the museum and wishing that his own Nation would also accomplish this someday soon. 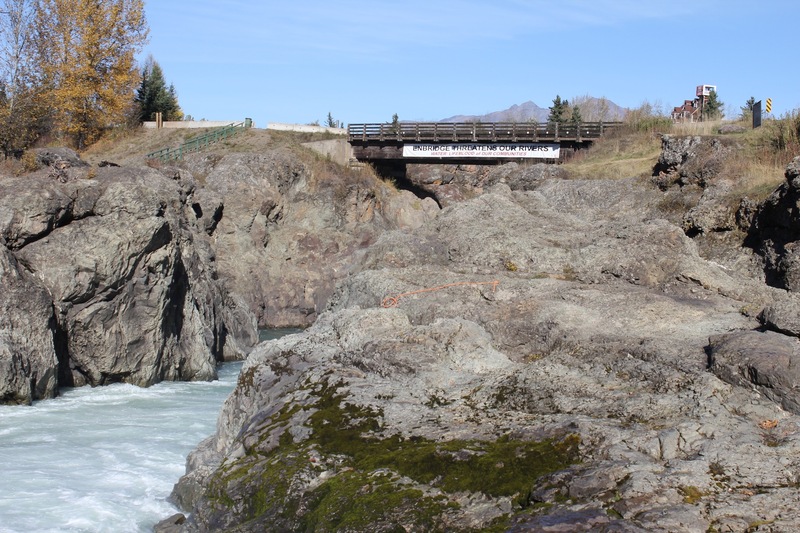 Why are places like the Nisga’a museum important? In conversations with Rocque, who teaches art history and anthropology at the School, the relationship between the empowerment of a people, especially in terms of the rights to their ancestral land, and the reclaiming of their material culture became more apparent. 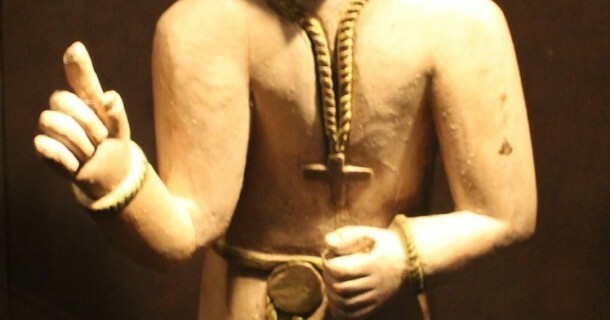 Reclaiming ones’ material culture, dissipated through the colonial period and beyond, is a sign of strength and of the rejuvenation of cultural practices. This is not just a matter of ownership of artefacts as the objects themselves are considered as powerful items, embodying an energy of a living culture. 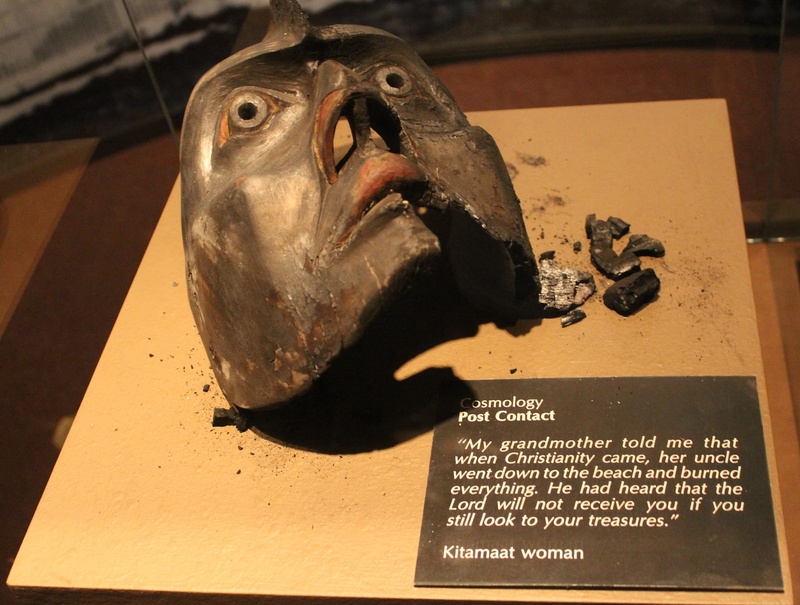 I also saw this in the documentary I did with the Pitt Rivers museum and the Haida Nation from Haida Gwaii, B.C. In this film, called Everything was Carved, I follow a group of Haida artists, musicians, educators and community leaders during their two week visit to the museum as they interact and learn from the pieces in the Pitt Rivers collection. I could see how the Haida treated the pieces with care and sometimes awe, regarding them as living presences of the culture that made them. The masks themselves are living representations of the animals and beings they depict and need to be danced in ceremonies to satisfy these entities. One of the masks was danced in a ceremony at the Pitt Rivers, it must have been waiting a long time on those museum shelves. The Haida also have their own cultural centre in Haida Gwaii and have managed to repatriate a number of artefacts from museums across the world. Of even more significance though, for the Haida and other First Nations groups, is the repatriation of the bones of their ancestors which were collected at the end of the nineteenth and beginning of the twentieth century. Reburying the ancestors in ancestral land, repatriating material culture, reclaiming the knowledge of how to make the art are then all parts of a long process of healing from the trauma of colonialism and state policies and to a strengthening of community. We had just left the Kitimaat Village, the primary residence of the Haisla First Nations, with warmth in our bellies from a delicious meal, and warmth in our heart from being enveloped by a captivating sunset that had slowly etched its way across the sky, grabbing onto each cloud to bring forth an array of yellows, pinks and oranges. 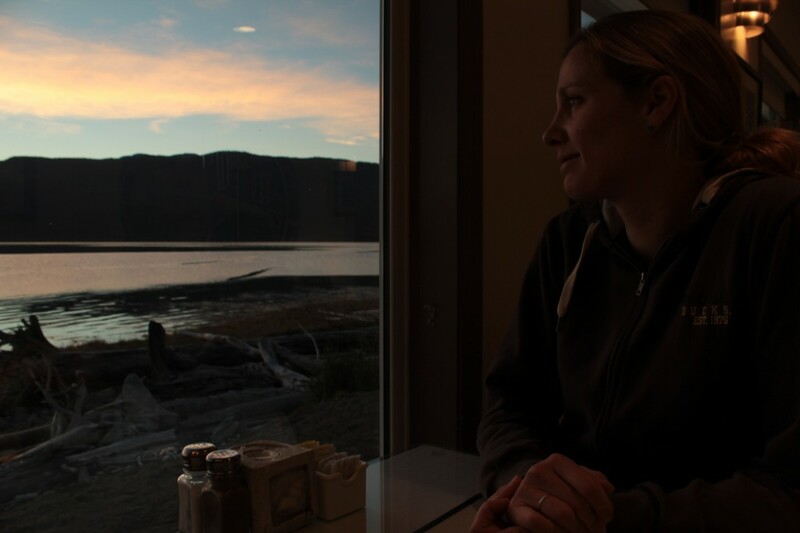 The single public eatery in Kitimaat, Seamasters Restaurant, as it was located on the edge of the Douglas Channel, a harbor that leads eventually out to the Pacific Ocean, provided us with a double gift of coloured sky and water. The water lapped calmly against the shore from soft ripples traversing its surface. Across to the other side of the harbor, perhaps three or so miles away, we could discern hills of evergreen trees, houses and boats – and the metallic sheen of industrial development on part of its edge in Kitimat, the ‘non-Aboriginal’ side, about a 30-minute drive away. The industrial complex has been built as part of the proposed Enridge oil processing and transport plan, in spite of its continued negotiation with over 60 First Nations communities across Alberta and British Columbia. 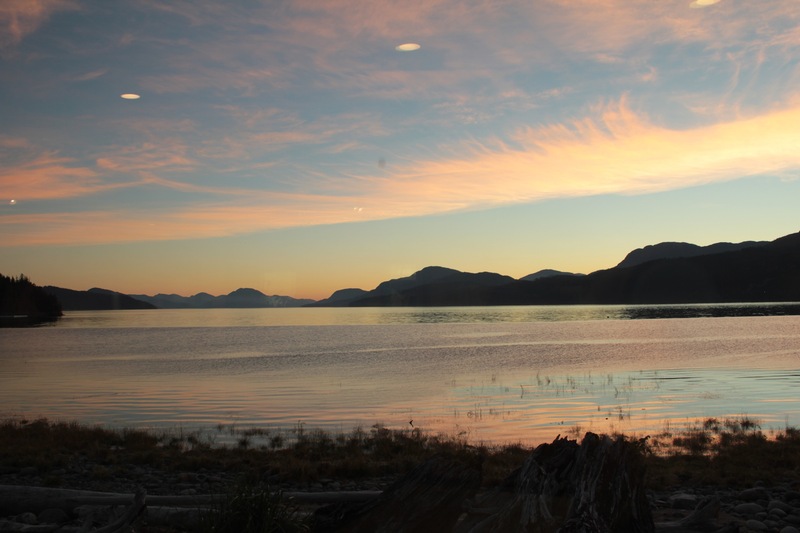 We had chosen Kitimaat Village without much hesitation, the Haisla residence with its highly recommended artistic shops and restaurant along the water’s edges. Seamasters was difficult to locate, nestled into the middle of the village, without a directional sign. We stopped to view a totem pole at the village’s entrance. It stood in isolation and we wondered about its story of creation and emergence. When we left the restaurant it was dark. A darkness thick from a fully waned moon. We were careful to drive slowly along the winding road that leaves Kitimaat through heavy forest until it reaches the highway that leads us the 50 kilometers or so back to Terrace. Not more than 5 kilometers from Kitimaat, I suddenly noticed a shimmer of light dancing across the sky which seemed to be out of place, not connected to any human-created light. I had Udi stop the car as soon as there was enough of a shoulder. 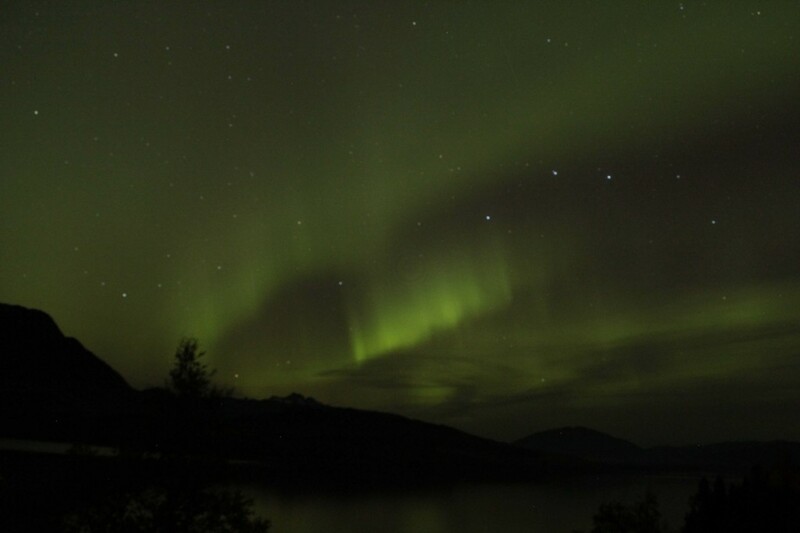 We stopped briefly as the shoulder was not wide or safe enough to witness the lights unfolding across the sky. The skies’ horizon was also hindered by large trees and the bright lights of cars passing more frequently than expected. We decided to drive the 45 minutes back to Terrace and explore ideal observation points from mapping options displayed on our GPS that was waiting for us in the hotel, and then go from there. The GPS helped us decide to drive up Highway 113 to a lake that, on the map, appeared to be far from any human habitation. Highway 113 sharply curved its way out of Terrace, continuing on for miles in an inky blackness. We were wary of running into moose, bear, wolves, caribou, deer, so we restrained ourselves from driving too fast. 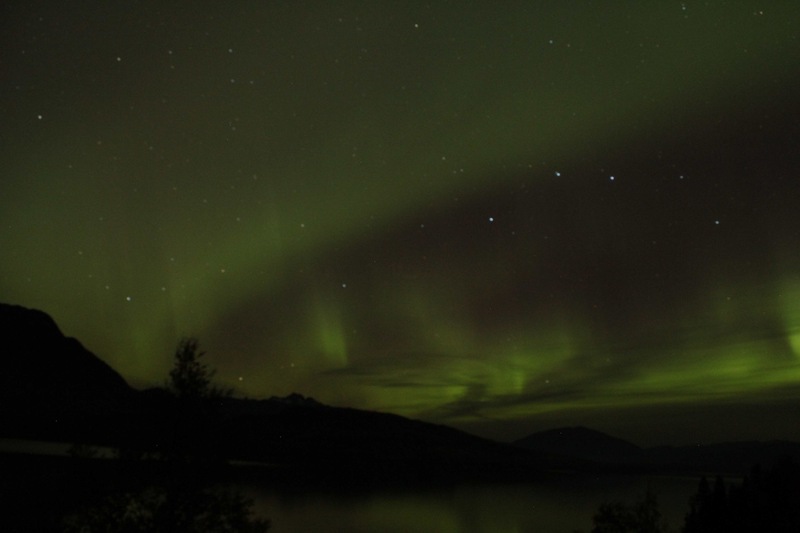 We did not see any Aurora brightening the night’s sky, and we thought perhaps that our opportunity to witness the elusive event had disappeared as quickly as it had made itself known. Determinedly we drove on, convincing our impatience to hold back until we found a place to stop, a place that provided a wide open view of the night’s sky. A wide turnoff appeared and we could just discern a lake below us. A view of the Big Dipper (or ‘Plough’ as I learned it is called in England) was clearly visible – directly in the middle of the sky’s northern horizon in front of us. It was nearly 10pm. We waited. We did not see any lights unfolding. 5 minutes, 10 minutes, 15 minutes, 20 minutes… I kept anxiously turning around every time I heard an unidentifiable noise, hoping that a bear was not choosing to pay us a visit. During this time we had noticed a faint band that seemed to dust the entire sky at about a 60 degree angle in front of us. 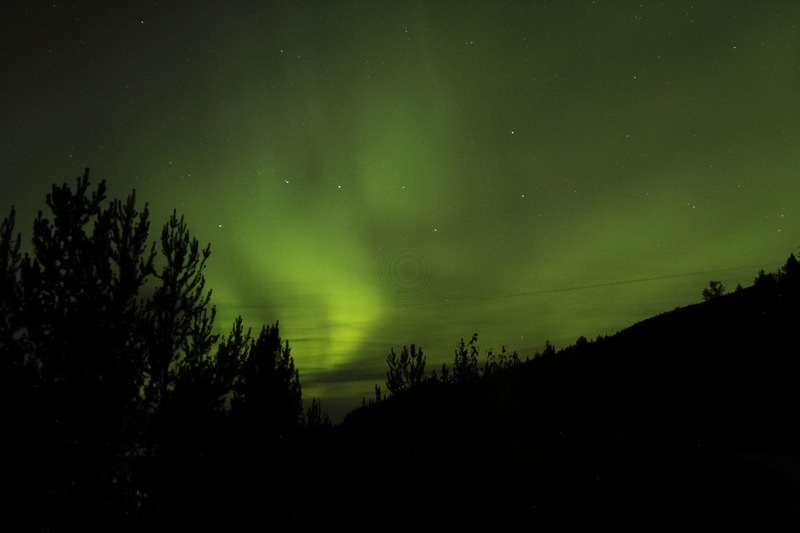 We wondered if that was part of the halo of solar particles that is the Aurora Borealis we had observed from photographs on the Internet gripping the upper northern hemisphere of the Earth – just two days ago. 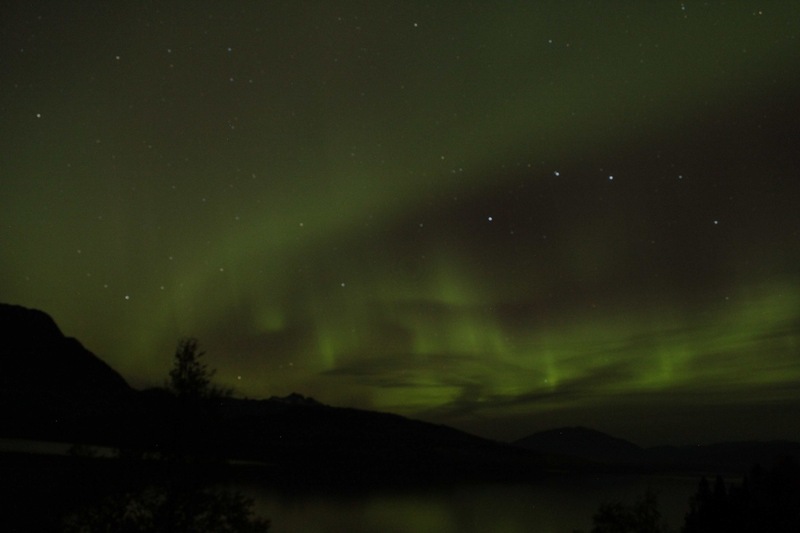 The appearance of the Aurora Borealis is not predictable, a clear sky and waning moon is necessary in addition to the clashing of charged solar particles and atoms high in the Earth’s atmosphere. Suddenly a faint being came into view. It was as if a dancer who has been dormant, without warning, performs a half-hearted body wave in a ethereal and luminescent suit, before resting herself into another position – less dormant, but resting and visible all the same. This single body wave seems to awaken another, and then another, a domino of dancers, each reacting to the other. The particular splendour of the view was the reflection of the Lights dancing on the surface of the water below. 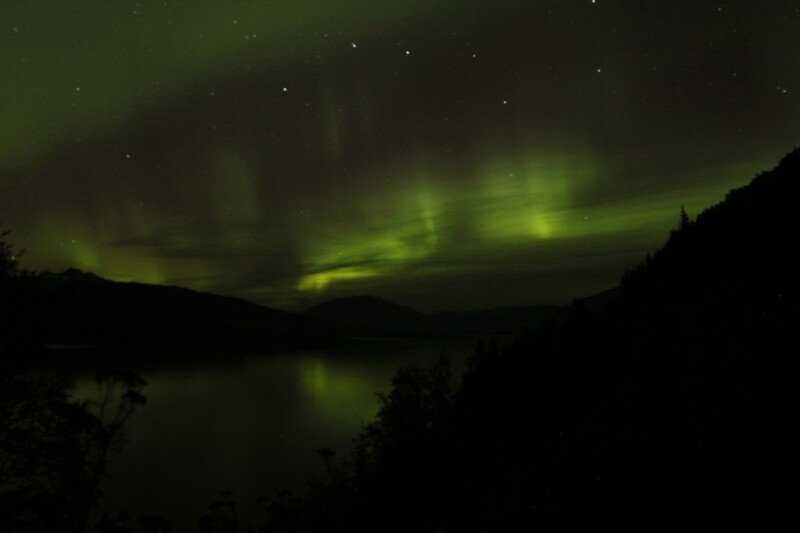 We later learned through Dempsey Bob that many First Nations groups relate to the Aurora as dancing spirits – appearances of their ancestors. We stood outside, marvelling at the lights when they appeared and waiting when they rested out of sight. The experience, especially the first time defies adequate articulation. It must be experienced. I felt the presence of my grandmother and other family and friends who have passed. They were somehow with me. Udi also felt it was a spiritual experience that is profoundly difficult to grasp in words. When we realized it was after midnight and we had an early morning a few hours in front of us, especially after a long day of driving, we reluctantly headed back to Terrace. The Aurora were resting again when we left. Not 5 minutes after driving south, however, I saw the entire sky light up and we stopped again at a small shoulder. This particular dance surpassed anything we had thus far witnessed. 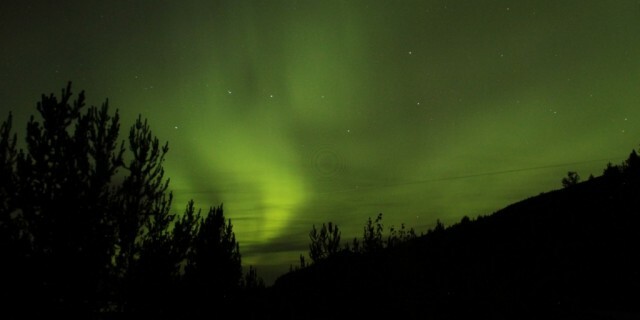 Some how the Aurora had shimmied its way right above our heads as well lighting up the sky behind us. The lights were radiating out of a centre point in slow, hypnotic rays, a light purplish colour, different to the ones we had seen in front of us. 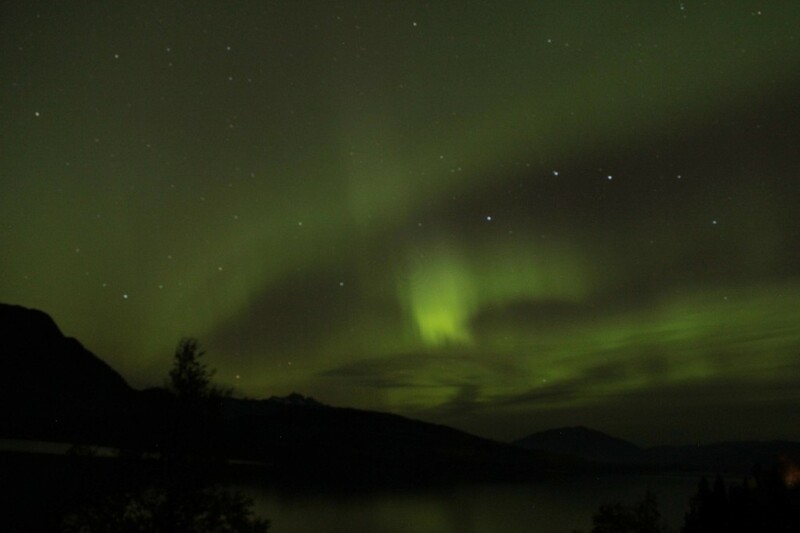 We were so awestruck that we did not manage to capture this part of the experience on film. This photograph below is of the illuminated sky behind us. We left Calgary early on the first Saturday of October bound for a small town called Terrace in Northern British Columbia, with the purpose of visiting the Freda Diesing School of Northwest Art. 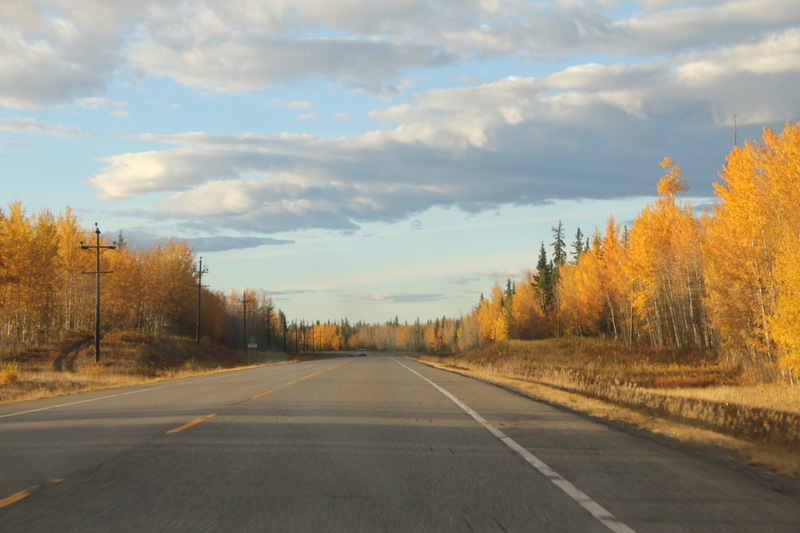 The drive was estimated to be about 20 hours and we planned to divide the days of driving with an overnight stay in Jasper, in the midst of Jasper National Park. 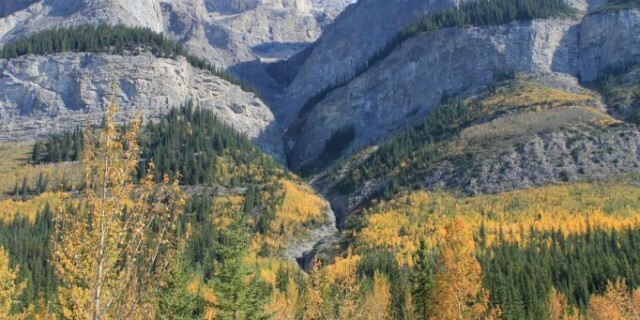 To get there, you have to also drive through Banff National Park. The views between Calgary and Jasper via Banff and Jasper National Parks are nothing short of extraordinary. Words such as ‘beautiful’, ‘amazing’, ‘unbelievable’, ‘mind-blowing’ are used in over-abundance and do little to convey the magnitude of the natural display of wonder through which the road traverses. The morning we left, I was jetlagged after returning the day before from a trip to the UK (the during which time I visited the University for the last time as an employee). The tremendous beauty that surrounded me in Banff and Jasper were a far cry from those intense days working as an academic. Although there were precious gems of collegial friendships I had developed with many inspiring students and other like-minded academics, overall, the geography of the academic environment was harsh and unforgiving, hardly nourishing or conducive to deep creativity and passionate purpose. During the four years I worked at the University I felt an intensifying hierarchy and lack of support. This is not the same experience for all early academics, but it was for me. I was often lost in a murky sea of politics, torn between commitments within two different departments, scurrying around like a headless chicken to keep up with an overload of teaching and often times losing my sense of purpose and self in the process. The glacially sculpted peaks and valleys of the Rocky Mountains offered an immediate respite, reminding me of the slow process of time through which each of us are such small, but deeply connected components. I also was reminded by how small my world had become in the mire of the University’s expectations and structure. Much bigger issues, such as climate change, that I could view firsthand in the receding glaciers at Banff and Jasper, are exponentially more important. The world is much larger, vastly more interesting, than the small-mindedness of universities whose primary objectives are to make themselves as big as possible within the global economy, particularly at the expense of the happiness of many of its staff, faculty and students. I also realized that the healing required from my experience working in academia – to unlearn ways of thinking that had been detrimental to my overall well-being – would be slow and erratic. Feelings and experiences embed themselves deep in each of our bodies, affecting far more than our minds. I felt an intense gratitude for these reminders surrounding me in the tremendous beauty of the sculpted Rocky Mountains, turquoise lakes, sublimely green ever-green trees and yellowing Autumnal leaves – and also the melancholic presence of melting glaciers amidst the beauty. 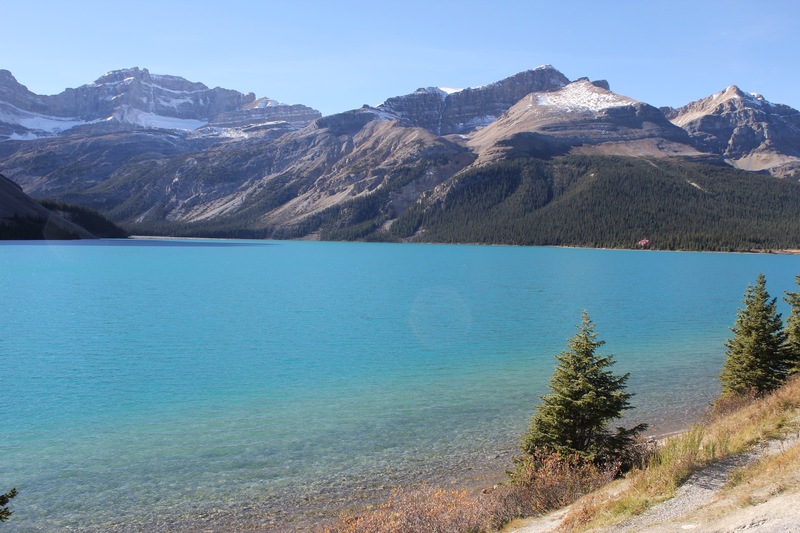 Although we hastened our travel to Jasper that first day of driving, we managed a few stops that brought us to the forefront of climate change processes. 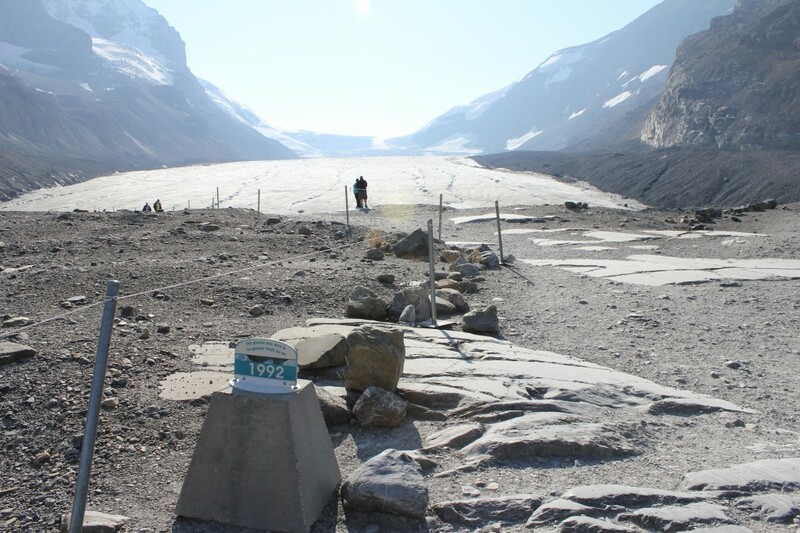 After marvelling at the turquoise waters of Lake Louise and Bow Lake, we stopped at Columbia Icefields to walk up the path to see the Athabasca glacier up close. At the turn off to Columbia Icefields, on the drive to the parking lot, we noticed signs that read 19012, 1920, 1945, 1960, 1980, 1992, 2000 – each demonstrated the level from which the glacier had receded, the most recent being 2000, at least 50 metres from where the edge of the glacier currently lay melting with torrents of small rivers and streams running off toward the turquoise lake below. We also stopped at Parker Ridge, on the side of the highway and walked 2km up a steep ascent to eat a small picnic lunch. The view hiking up the snaking avalanche path was as impressive as the drive and we felt alive as our lungs were working harder to grasp oxygen from the thinning crisp air. The only downside of the view was a haze of smoke from controlled forest fires in British Columbia. Along the path, stunted alpine evergreen trees and wildflowers thrive here in the desert-like landscape that brings constant blasts of wind. Once we reached the crest of the ridge, the most extraordinary sight beheld us. We were transfixed. 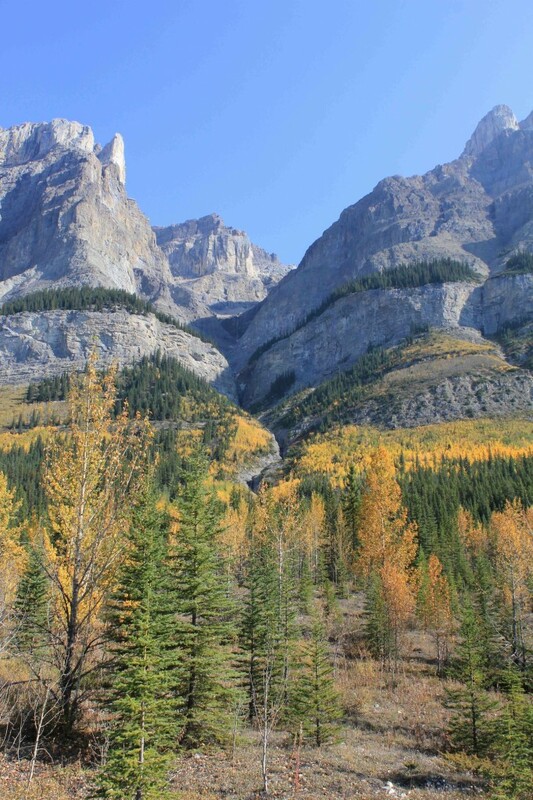 Through at least a mile or so of evergreen and Autumnal yellows of forest cascading below us lay an untouched valley with a rivulet of streams and rivers cutting their way through from a massive glacier on the right that we approximated to be at least 5 miles long. 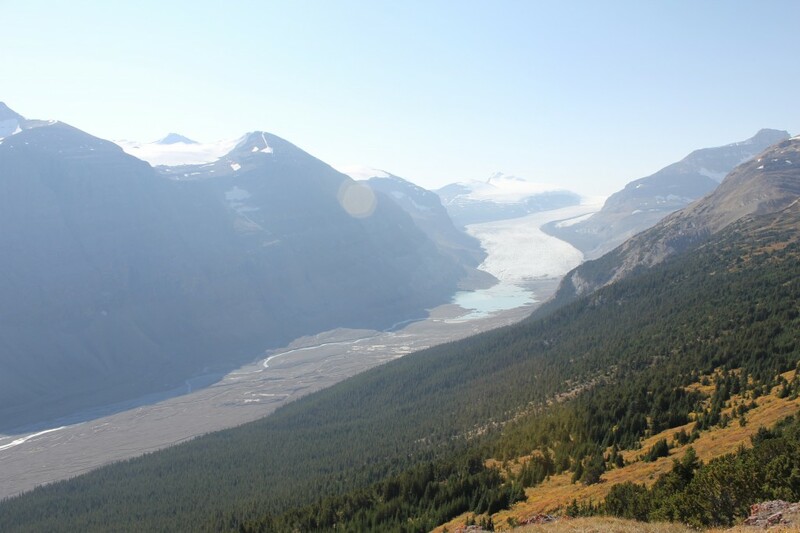 The massive Saskatchewan glacier, which dwarfs the Athabasca glacier at Columbia Icefields, we later learnt, creates the North Saskatchewan river that flows over 700 miles to meet with the Saskatchewan River in Saskatchewan and eventually empty into Lake Winnipeg. Our overnight stay in Jasper was in an overpriced hotel that was more like a glamorised hostel, with a shared bathroom for the hallway, but a separate box-shaped bedroom with gold fixtures on the lamps, bed, dresser and windows. We happily left Jasper bound for the furthest town we could reach before dark. We remembered to fill up on petrol as the nearest petrol station was a 4 hour drive away. 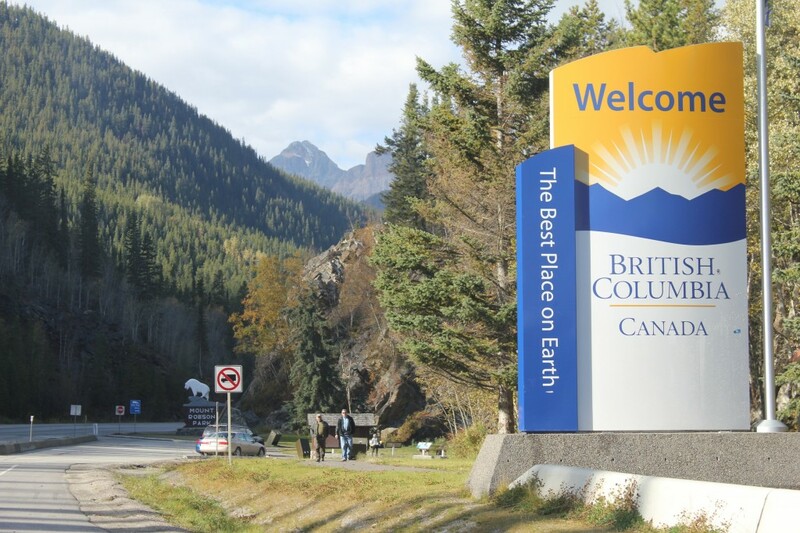 We entered British Columbia a couple of hours after leaving Jasper. 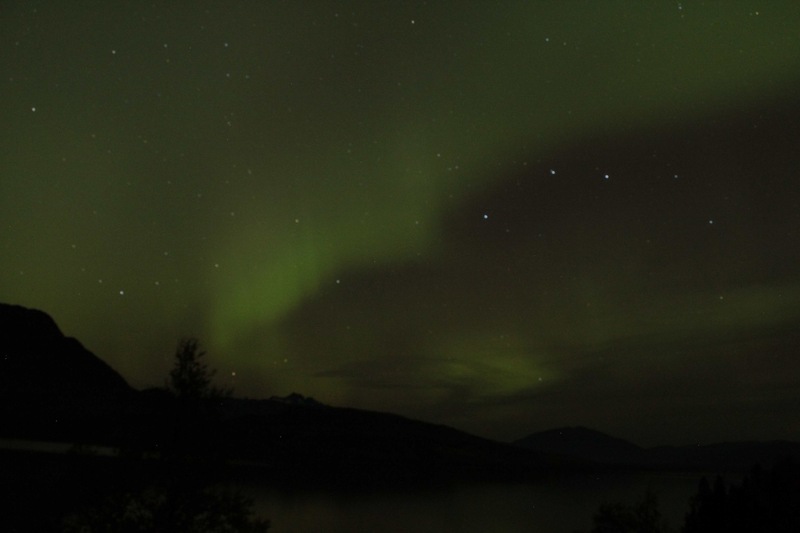 That night, we made it as far as Burns Lake, a small town at least 200 miles from Terrace. 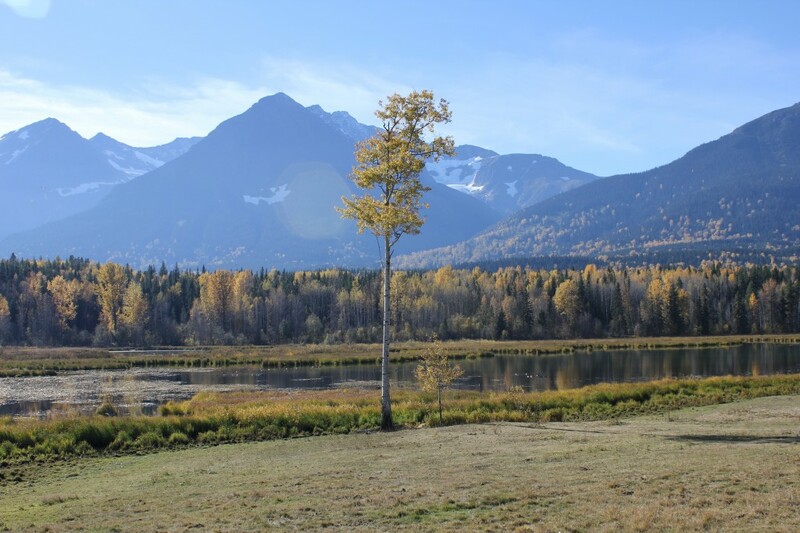 The drive to Burns Lake from Jasper was engrossing, a continuous flow of mountainous peaks and valleys amidst lakes and rivers, endless evergreen trees and the red, oranges and yellows of aspen, cottonwood, alder and other deciduous trees at their Autumnal peak. Our only stop along the way was spontaneous, about 5 or so hours into the drive. We noticed a sign that said ‘Ancient Forest’ which piqued our interest. It turned out that this sign led us to a moderate 1 mile hike through an ancient cedar forest where the cedar trees were as old as 2,000 years. 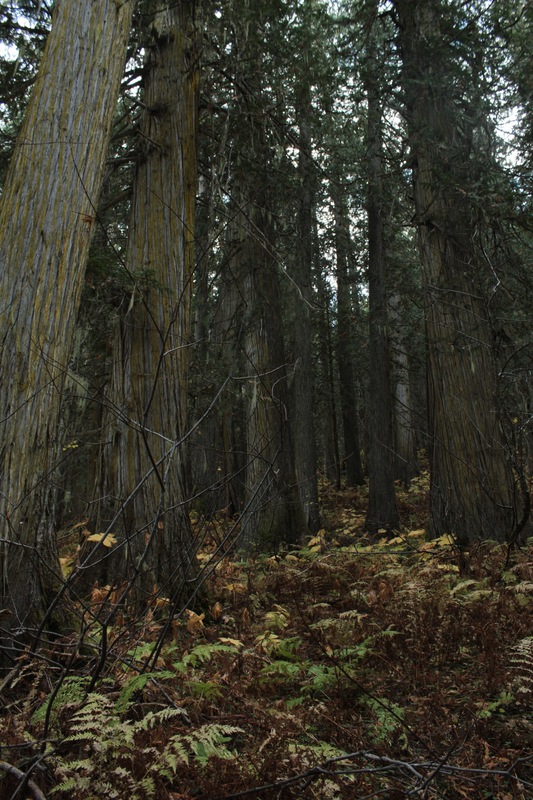 This forest is a temperate rainforest and very rare for being so far inland, especially for North America. We learned that the golden moss growing on the majority of the trees only forms on trees more than 250 years old. The intense oxygen and sweet aromas from the ancient cedar forest were more than enough to sustain us for another 5 hours of driving. 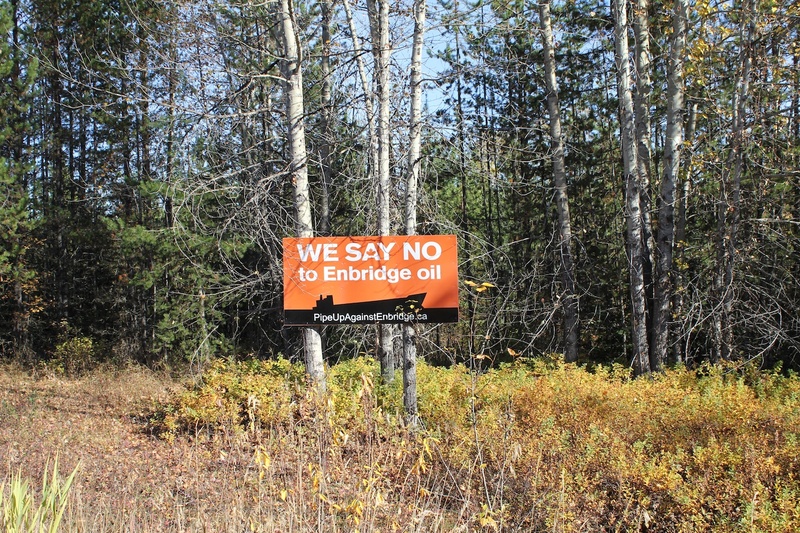 We also made a brief 5 minute stop to get a good photograph of a ‘No to Enridge Pipeline’ sign. We had noticed several posters plastered onto signs along the way, but this particular one had been rigged up on a bridge over a fast-flowing river just off the highway. The controversial Enridge Pipeline project is two parallel pipelines from the Tar Sands in Northern Alberta to Kitimat, each with a length of over 700 miles. The primary reason for this proposal is to open Canada’s oil market to China and other Asian countries. The proposal was first set forth about 7 years ago. Although there has been a significant amount of financial incentive offered to at least 60 different First Nations communities, not one community has agreed to accept. 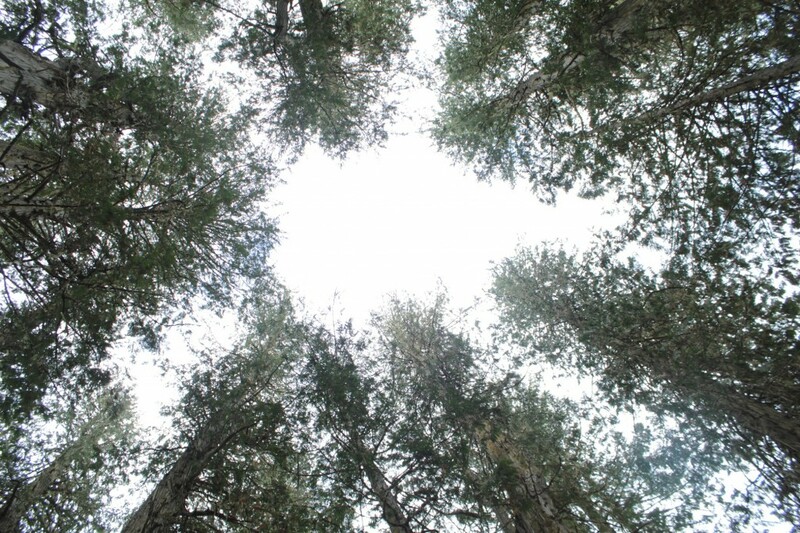 The reasoning behind this is not only because of the sacredness of the land historically to all First Nations peoples but also because of the incredible fragility and diversity of the plant and animal life which comprises the temperate rainforest land that the pipeline would pass through, affecting not only salmon runs, but habitat for all species. 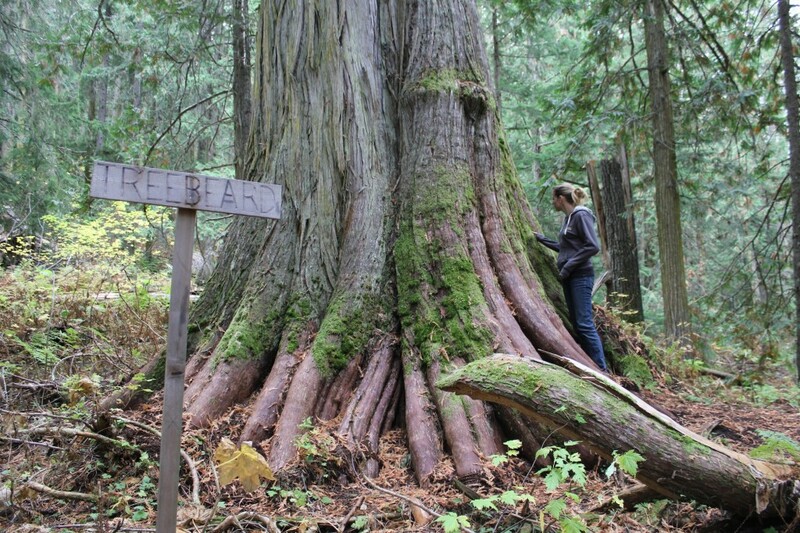 National Geographic wrote a special article in August 2011 about the critical protection needed for the Great Bear Rainforest – ‘a wild stretch of western cedar, hemlock, and spruce forest that runs 250 miles down British Columbia’s coast. Whales, wolves, bears and humans thrive in the rich marine channels and forests of the Great Bear’. There have been and will continue to be numerous protests about Enridge in Canada and the US. In addition to Enridge, there are other pipeline projects proposed such as Keystone (running from the Tar Sands in Northern Alberta all the way to the Gulf of Mexico in Texas) and the Trans-Mountain pipeline system from Edmonton to Puget Sound, in Washington state in the US. Each of these proposed pipelines (Enridge, Keystone and Trans-Mountain) are intensely controversial – particularly for First Nations and Native American communities. When we were in Victoria after our visit to Terrace, we learned that there was a blockade of activists protesting Keystone in Texas, many of whom were imprisoned. Daryl Hannah, the actress was among the activists which brought greater media attention to the efforts committed to blocking the construction of Keystone. These pipelines are highly contentious, but with the economic crisis being such a burden to so many people while the hunger for oil grows, the imagined need for Enridge, Keystone and Trans-Mountain is bound to strengthen. That night, during our short stay in Burns Lake we were told by the motel owner that he had seen the Northern Lights just a few days before. We could only hope to be so lucky, this was something that Udi and I both had long wanted to witness. The next day we drove the 4 or so hours to Terrace, stopping along the way in Smithers, to see one of the Northwest College campuses after noticing a sign. 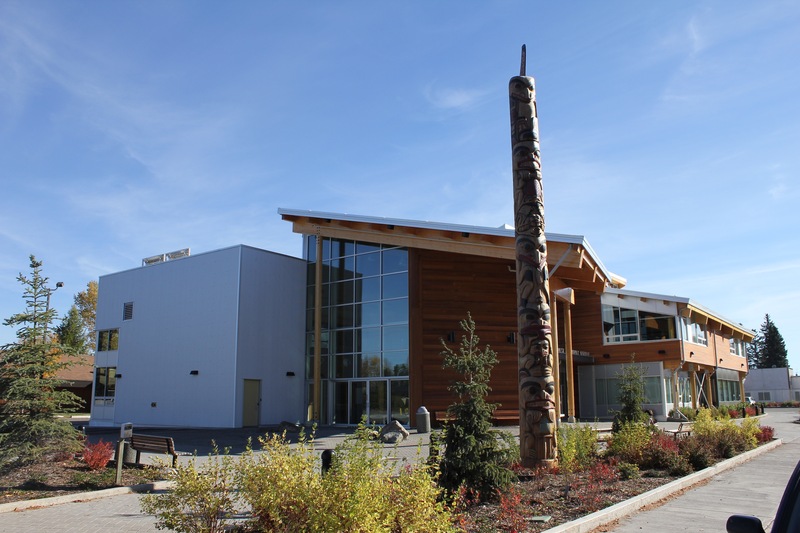 The Freda Diesing School of Indigenous Arts is also a part of the Northwest Community College satellite campuses and we were curious to visit the NWCC Smithers campus. In Smithers, we learned, students can take a variety of courses not only in education and computer technology, but also preparatory skills for geological exploration and mining. We arrived in Terrace with much excitement in the middle of the afternoon, finding a place to stay for the next 4 nights with much more difficulty than assumed due to the influx of oil and gas workers in the area at the time. 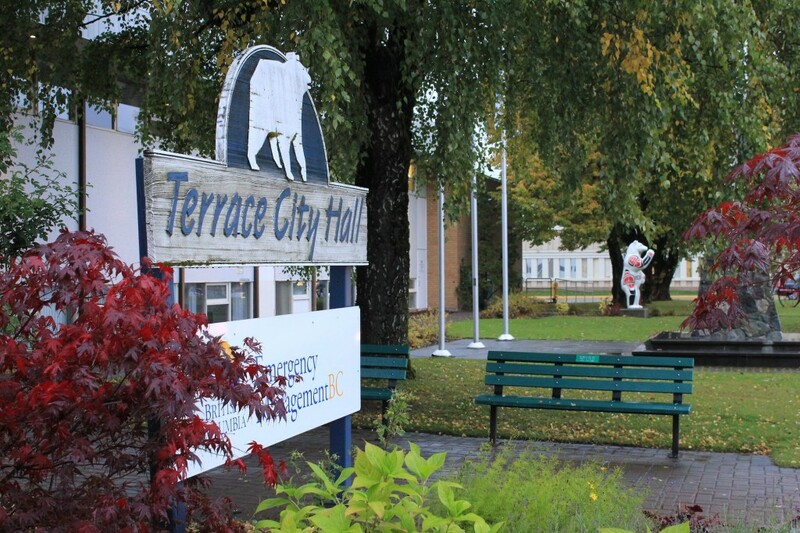 The symbol of Terrace is the ‘Spirit Bear’ – or the Kermode a s it is officially known – a white Black bear, the subject of the National Geographic article mentioned above and an animal of extreme spiritual significance for many First Nations peoples. 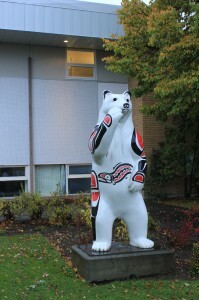 The Spirit Bear is notoriously elusive but can occasionally be spotted in this area. 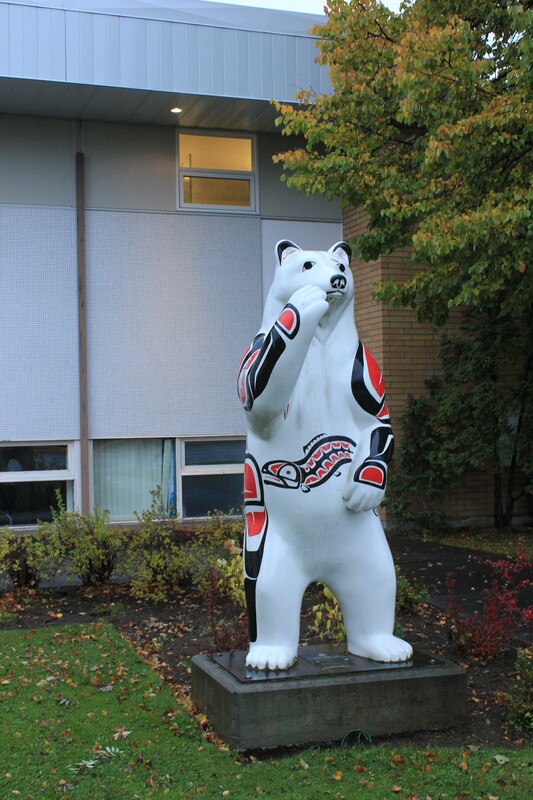 As the Spirit Bear is the symbol of Terrace, there are several life-size sculptures around town, each painted with ovoids and animals symbolic to First Nations communities. I think it is probably safe to say that most of us, if not all of us, have visited sacred, spiritual or religious sites of some sort or another – either as part of our own belief system or that of others. Our reasoning for visiting sacred places varies as does our interest and openness to how we connect with them and how these connections might or might not affect our lives. 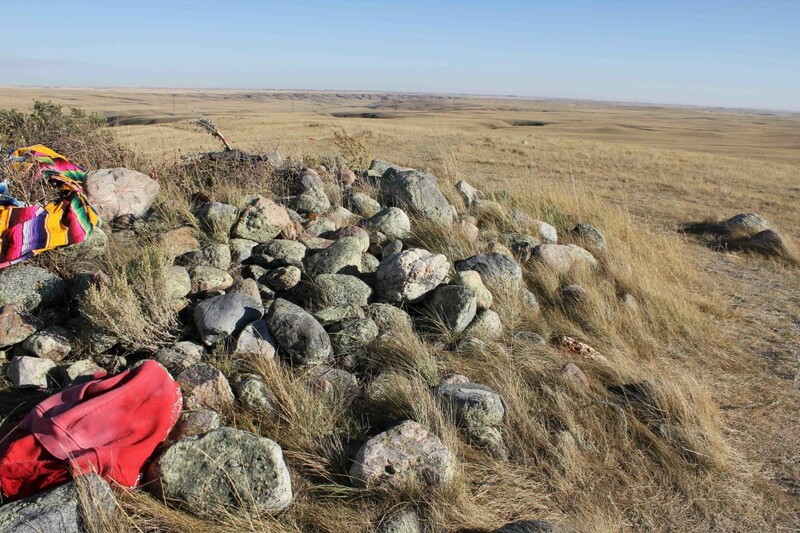 For students, teachers, Elders and community members involved either directly or indirectly in the Kainai Studies program at Red Crow, learning and engaging with sacred places is about reconnection, reclamation and repatriation. What we learned through reading literature by Cynthia and Narcisse (and also Betty Bastien), and also through different conversations with each of them and Ramona, Ryan, Adrienne, Alvine and Duane was that learning about sacred places was not just learning about them, but rather to learn from them. To learn from a place mean that participants within the program needed to not just tour them, but rather to visit them (Cynthia and Narcisse write beautifully about this process in their article, ‘Love thy Neighbor: Repatriating Precarious Blackfoot Sites’ which we will be adding to the links/resources section of this blog). But what then does it mean to visit? 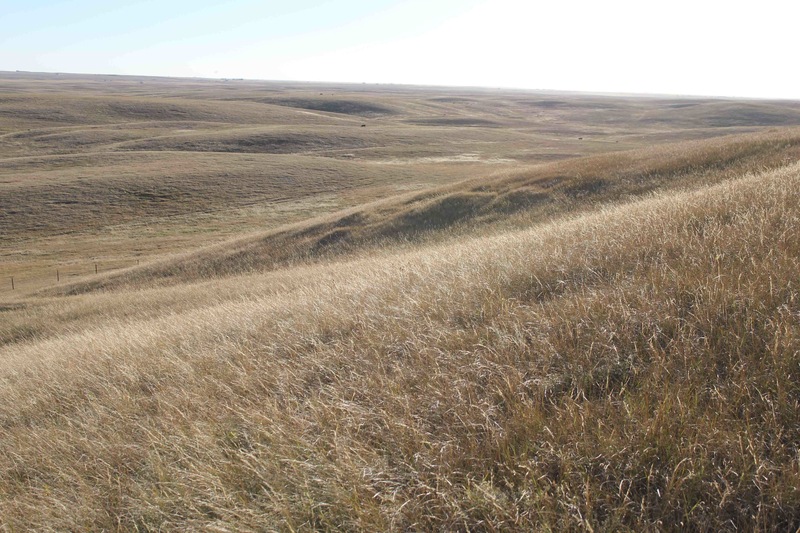 And how, can we as learners from the outside also learn about the significance of visiting sacred sites, especially as a core component of the Kainai Studies program? 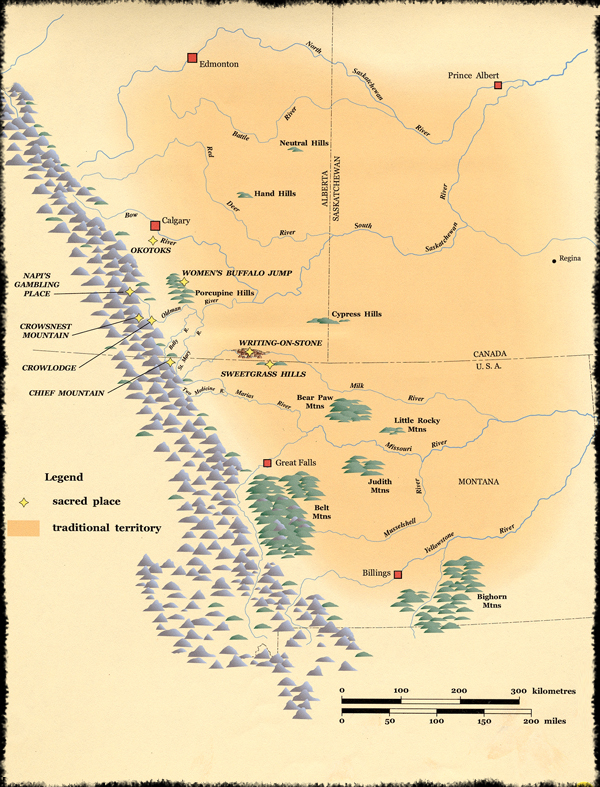 The original Blackfoot territory, or Nitáówahsinnoon covered most of Alberta and Montana and parts of Saskatchewan. Within Nitáówahsinnoon the Blackfoot developed intimate knowledge and close relationships with all dimensions of the environment. These relationships were renewed through ceremonies and ritual as well as reciprocal practices of visiting and providing nourishment (see Cynthia and Narcisse’s article and Ryan Heavy Head’s writing for much more detailed information). Ceremonies took place at different times, at sacred sites for different purposes for thousands of years and were nearly erased due to the heavy layers of oppressive actions felt by the Blackfoot peoples over the last 150 years. Because of the power of stories and secretive practice of ceremonies, knowledge surrounding sacred places endured. Yet, currently, much of this knowledge is fragmented and weak (as some has been lost as a result of the Indian Act and residential schooling, amongst other reasons) and is currently being re-built through efforts such as the Kainai Studies program. The landscape of Nitáówahsinnoon is itself storied as Cynthia and Narcisse explain. Each sacred place has a story about its emergence and many sacred places have stories that were written on them through pictographs or petroglyphs. For Siksikáítapiiksi, these places are not simply piles of rocks, cliffs, or glacial erratics; they are places imbued with meaning and history. These places are the equivalent of books, encyclopedias, libraries, archives, crypts, monuments, historical markers and grottos; they are destinations for pilgrims; places of sacrifice, revelation and apparition; and sources of knowledge and wisdom. For Siksikáítapiiksi, these places are repositories for the knowledge left by the ancestors. Prior to the onslaught of colonialism and settlers, there were thousands of sacred places throughout the Blackfoot territory. The majority of these places have been demolished, precisely because they are seldom seen as anything but rocks, stones or cliffs. While we were staying in Fort MacLeod there was front page news that the Glenwood ‘glacial erratic’ (this is the term used by the Canadian government for giant seemingly out-of-place glacial stones) was desecrated – petroglyphs on top of the stone were literally drilled apart and acid was poured on pictographs to distort and erase the fading colors barely present. The stone is so large that to carry out this type of desecration, more than one person would have needed ladders, lights and heavy equipment. 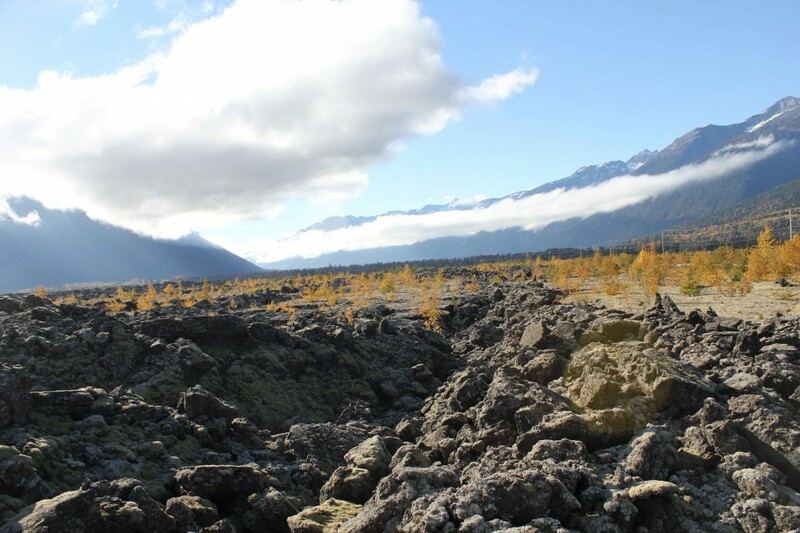 The destruction was discovered by a Blackfoot historian who had just received approval from the community to begin archaeological investigation into the petroglyphs and pictographs at the place. 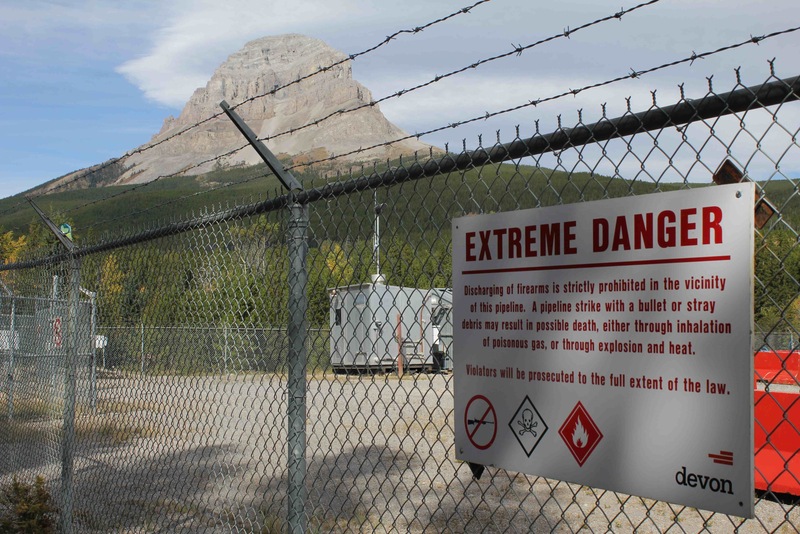 Worst of all, the site was not listed in the Alberta historical places and has only become more widely known because of the violence induced at the site. News of the desecration of the Glenwood place was felt strongly by the people we met and by both of us. We had been there for just over a week, but had already begun to learn with the landscape, visiting several sacred places amidst reading and conversing about them. In addition to the desecration of Glenwood, many other sacred places are in danger of being destroyed due to the constant pressure of oil and gas drilling. At the end of our stay in Alberta, as we drove North to Calgary, we stopped at the ‘Okotoks’ or ‘Big Rocks’ as they are known in Blackfoot. 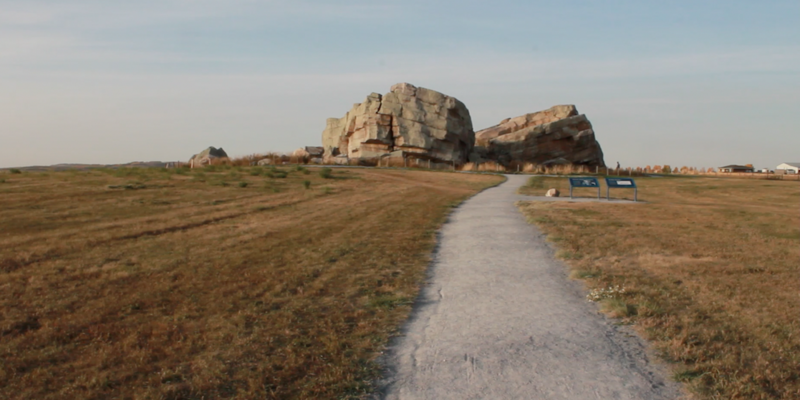 These massive rocks are also known as the Okotok ‘glacial erratics’ although they have been visited by the Blackfoot through ceremonies over thousands of years. 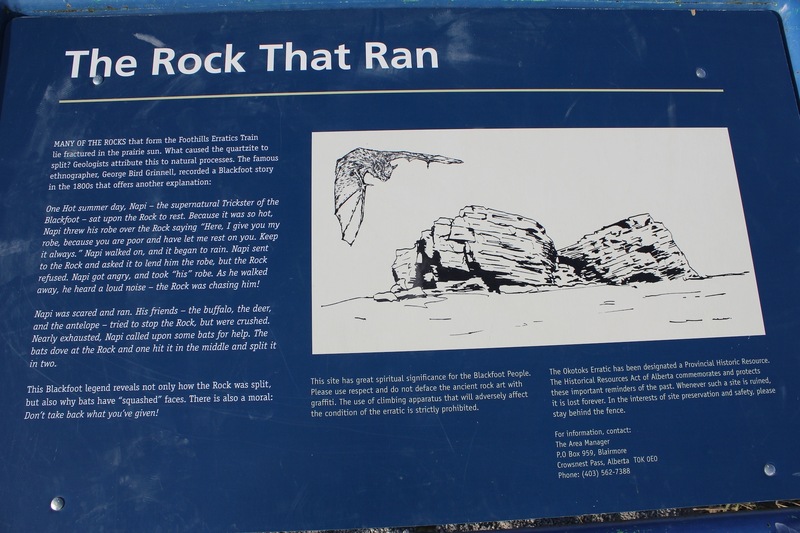 The story of how the rocks got there is that the Creator Napi was being chased by the rocks because he had offered his robe to the rocks when it was hot but had asked for it back when it was cold. The rocks said that the robes had been given to them, but Napi took them anyway which made the rocks start chasing him. This chase created the hills and the landscape. These particular ‘Big Rocks’ chased Napi further than any others. They stopped and cracked where they did because some birds farted on them. Photo taken by Udi of the signage before the walk to the ‘Big Rocks’. There is information from a scientific perspective and from a Blackfoot perspective. This sign shows the story of Napi and the landing of the rocks in this particular location. Udi and I located the ‘Big Rocks’ about 10km west of the town of Okotoks which is about 50km south of Calgary. The rocks appear as huge anomalies in the landscape. 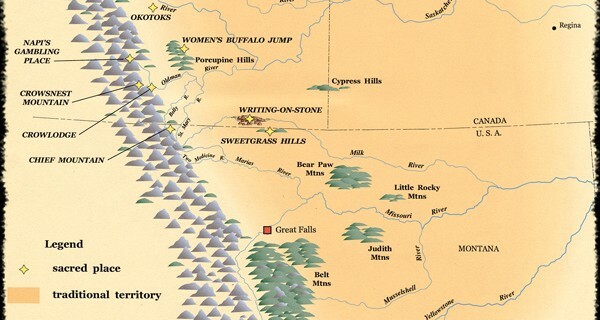 The Blackfoot story of the Okotoks makes them come alive and we felt a closer connection to them reflecting on this story, rather than the only through a scientific explanation. Here is a youtube video I found that helps to experience the ‘Big Rocks’. Photo by Udi of the ‘Big Rocks’ from the path. Notice the two signs explaining the ‘Big Rocks’. Our first visit as mentioned in the Land, Buffalo and Blackfoot post, was to the Head-Smashed-In Buffalo Jump Museum. Although this site is indeed a sacred place to the Blackfoot, it is now acknowledged more widely (well beyond the Blackfoot people) as a place to learn from and about the incredible history of the Blackfoot people, including the profound relationship the Blackfoot had with the buffalo and the tragic decimation of the buffalo, due almost entirely to the lack of reverence and respect of European settlers. Our second visit was to Crowsnest Mountain and Crowsnest Pass, about one hour directly west of Fort MacLeod, within the Rocky Mountain range. The drive to Crowsnest was itself stunning as we had not seen the Rocky Mountains since our drive through Glacier National Park. 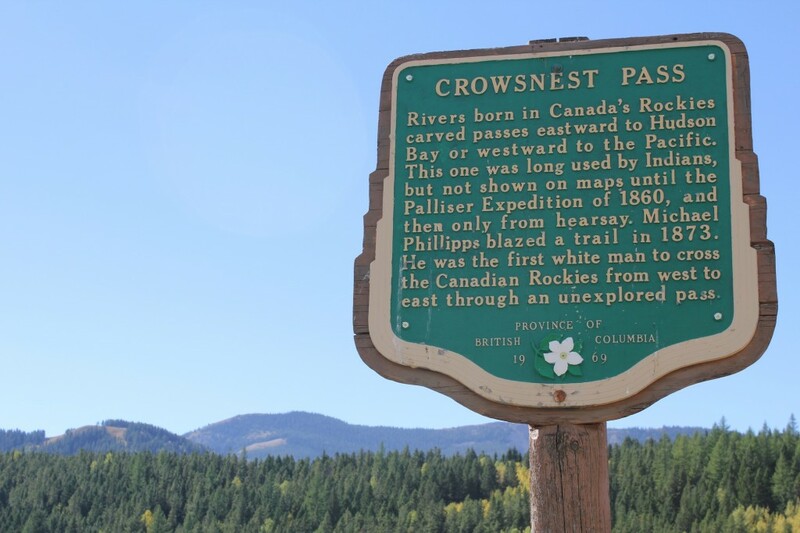 We were unable to locate the precise place of Crowsnest Pass, but we did locate a sign that identified the region as a place of heritage importance for Canadians, with a brief mention of ‘Indian’ usage of the place as well. This historical positioning of the Blackfoot as ‘hearsay’ or ‘pre-historic’ is common discourse, relegating the history of the Blackfoot as something before White man history began. We drove up a road about 10 miles to be closer to Crowsnest Mountain. Similar to Chief Mountain which is 50 miles south, Crowsnest stands out strikingly in isolation from the other mountains. We stopped the car next to a natural gas pipeline tank with warning signs of ‘extreme danger’ on the fence surrounding it. This picture demonstrates the prominence of the mountain and the ever-encroaching development that endangers the longevity of all sacred places. 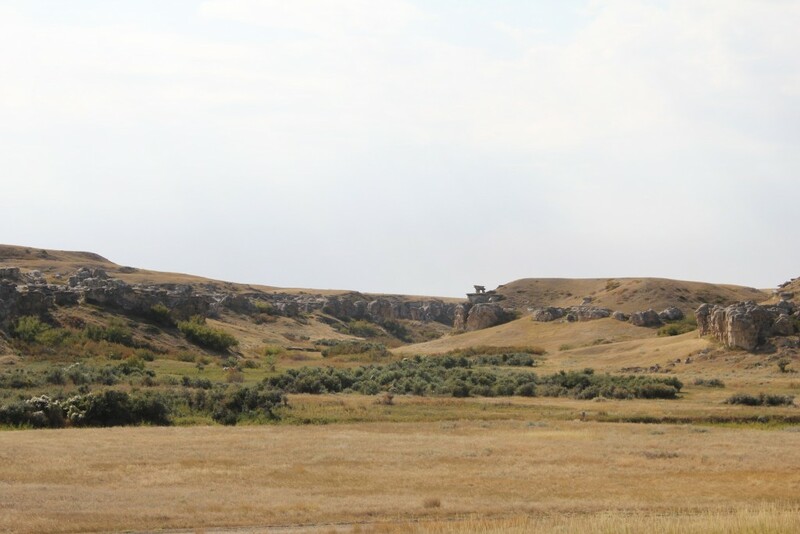 Our third visit was to Writing-On-Stone Provincial Park, an archaeological and natural preserve near the Milk River, just above the United States border. We had dinner with Cynthia and Ramona the night before we visited Writing-On-Stone at a popular restaurant in Fort MacLeod, called Jonny’s. They both urged us to visit Writing-On-Stone. The next day, after a 2.5 hour drive, we arrived just in time for a 3-hour guided tour from a younger Blackfoot woman. 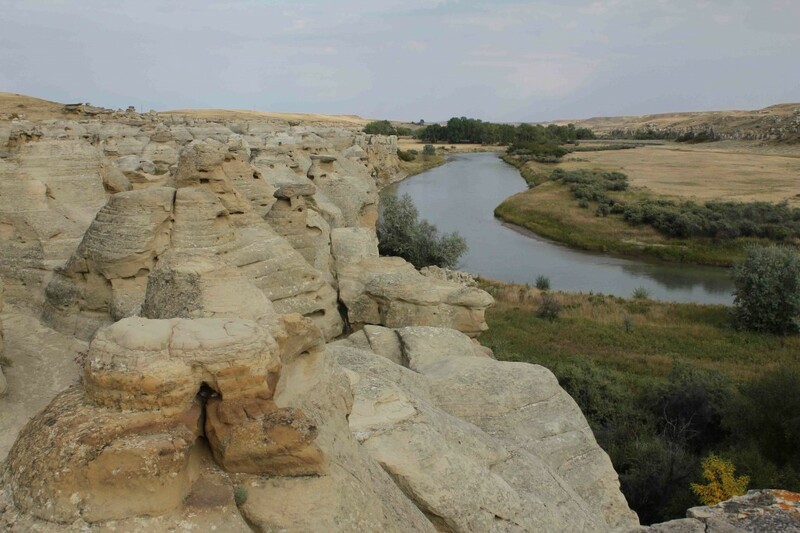 Writing-On-Stone is a wondrous landscape within prairie where you also see sagebrush and wildflowers, especially at the edge of the Milk River that winds its way through the coulees. There are marvelous hoo-doos that have been eroded from the sandstone and writings and pictures carved continuously for the past 4,000 years. In this picture is a famous hoo-doo that was also used as a place for Vision Quests for thousands of years. Today, this site generally and more specifically this hoo-doo is a sacred site where blessings are offered. Ancient petroglyphs are still noticeable in many areas, although newer, graffiti is also present. The forms of petroglyphs and pictographs being the Blackfoots form of literacy is still being debated. 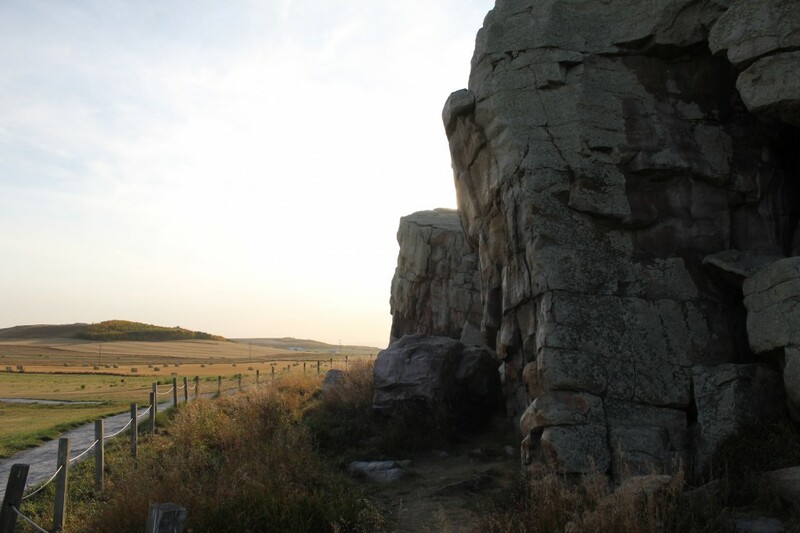 Narcisse explains very descriptively in a blog-posting that whilst ochre pictographs were drawn onto the Okotoks because of the hardness of granite, at Writing-On-Stone, stories were carved into the rock as petroglyphs as the sandstone rock is much softer. 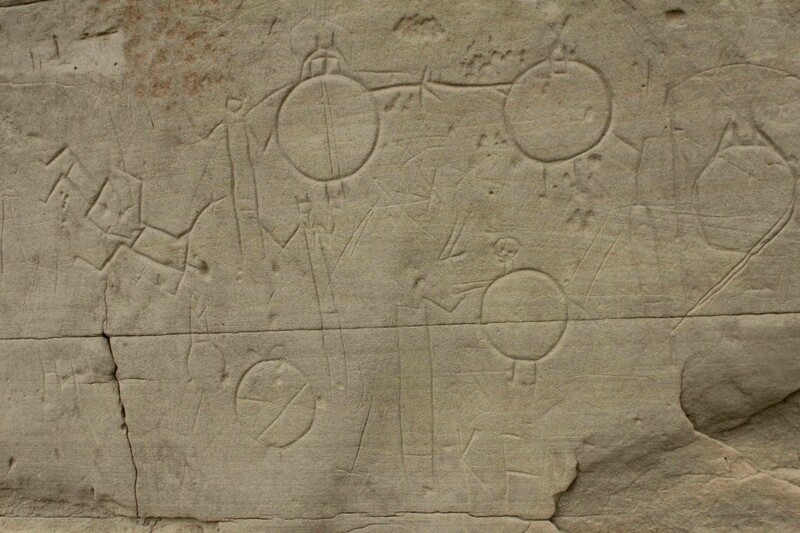 Here is a good experiential short video of Writing-on-Stone on youtube and another one showing different petroglyphs with brief explanations (just be patient for the first 20 second advertisement!). Our guide told many stories represented through the different petroglyphs and was also very open about her own life and Blackfoot learning. The three hours passed by very quickly. The storied landscape spoke deeply to us, we were absorbed in the colors, the formations and the stories told. Woven through these moments of different visits to places and to meals with different people (such as Cynthia, Ramona and Erika), I was reading various articles and books. Two days after our visit to Writing-On-Stone, I had just read through Cynthia and Narcisse’s article for the first time and I was completely taken by the style of the writing and the stories conveyed within. In particular, I was very moved by the section discussion ‘visiting as repatriation’ and felt a strong desire to better understand visiting as a process rather than a single event. In the article, Cynthia and Narcisse mention Carolla Calf Robe and her annual visits to Sundial Butte to make offerings and ask for blessings for her family. After an accident when Carolla was confined to a wheelchair, she was carried up to the top of Sundial in a wheelchair. She was resigned to the fact that she might never visit the site again. This resignation and effort to make that visit helped her to find a renewed strength and continue living in a new way. This story spoke to me of the importance of these places being about renewal and connection. 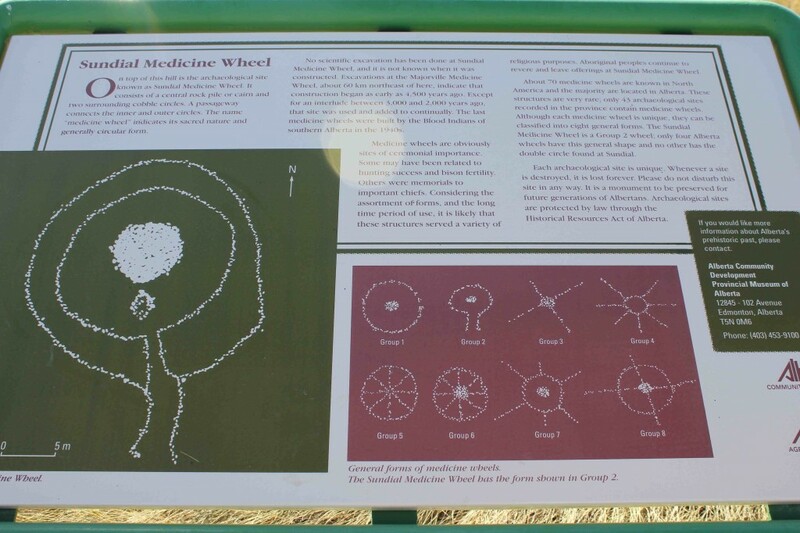 With our afternoon suddenly free, Udi and I both agreed that finding and learning from Sun Dial Butte (or Sun Dial Medicine Wheel as it is most commonly called) was a great idea. Locating Sun Dial is no simple task. There are gravel roads criss-crossing the plains, which at this point are mostly farm lands. We stopped to ask for directions and were given a simple list of where to go. I also had written out directions from the Internet. These did not match… we were better informed by a rancher along the way who directed us perfectly. There is a beautiful conversation filmed at Sun Dial with Narcisse Blood talking about Sun Dial and the significance of sacred places and the necessity for altering our relationships with the land that is based on reciprocity rather than extraction for our use. Udi and I stayed on top of Sun Dial for more than 2 hours, sitting, meditating, walking around, slowly, intentionally. We were there on our own. The sun was warm, a gentle breeze blowing strongly and then softly. We agreed that there was a profoundly strong, yet gentle strength. The experience of being there is difficult to articulate. … those moments under the sun’s rays at Sun Dial, I felt a sense of completion. It was a gentle peacefulness, but strong like the beating of my heart. This peace was something about … being … connected — to time – all those beings past and present who had been here at this place called Sun Dial, all those who were there. I felt that all-is-well – regardless of… it just is. Pain and suffering drift into the wind, the voices of ancestors whispering and beckoning within the stones. I felt as if I was somehow a deeper sense of myself – a self inseparable. This is the moment I really began to develop a deeper understanding about what ‘indigenous knowledge’ is. I felt a sense of power – not a power to control or master, nor a power to be heard and seen – but rather, a power to be a part of… love or fear, it did not matter. I look around and see how so much is based on fear and power – a need to be in control and to manipulate. Sun Dial is the opposite of this. Thousands of years have witnessed beings gathering here at this site – to connect to one’s inner-outer being – to connect to stories of the ages that are told as if they happened yesterday. Thousands of years. Power has been manifested here through the mode of giving – of self to self, of self to land and of self to other selves through transfers of stories, song and ceremony, through offerings and gestures. We left four sage cuttings amidst the stones, resting them gently symbolising the importance of the number four, as Ramona taught us. Through such a profoundly simple gesture of gratitude and appreciation, I felt, I learned something of the Blackfoot way of knowing – I felt that I began to connect deeply to the past – all pasts, presents and to future connections. It made me curious, more curious than I have been in a very long time. But, mostly it made me feel alive. This visit to Sun Dial and the other visits to Head-Smashed-In, Writing-On-Stone and Crowsnest Pass and Crowsnest Mountain provided deep learning experiences for us. Yet, these experiences were the tip of the iceberg of what we could learn through a much longer stay and much deeper engagement. However, making ourselves open to being present within these places helped us to feel their sacredness, beyond a more rational way of knowing.